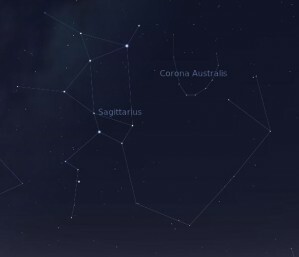 Following on from the last astronomy post I thought it’s well worth mentioning Sagittarius, the little teapot appearing just over the eastern horizon during winter. 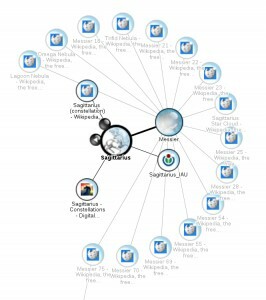 Sagittarius has one of the densest clusters of Deep Sky Objects in all of the constellations, as it covers the very centre of our galaxy, making it spectacular to view from somewhere without much light pollution. 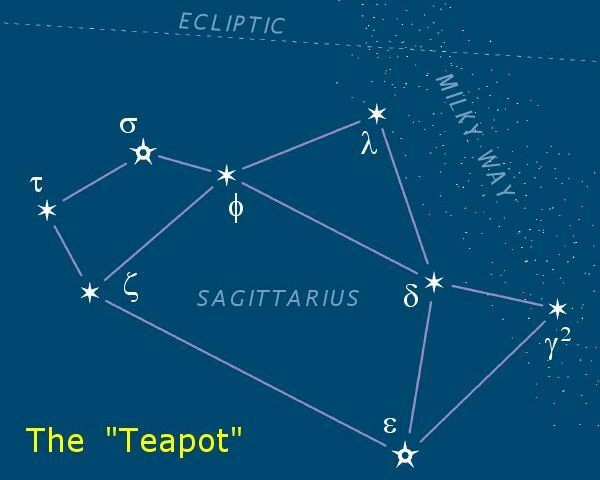 The ‘teapot’ shape (the teapot sits with it’s spout pointing directly up from our eastern horizon) is the head, shoulders and bow of a celestial archer according to the greek constellations. Sagittarus - as seen from New Zealand just over the eastern horizon about an hour after dark in July 2011. To the north of the teapot’s spout is where most of the Messier objects in Sagittarius are located, the globular clusters being M22 and M28 and the open clusters being M21 and 23 and all of which are spectacular! Whilst these two types of objects can appear very similar whilst being observed in the night sky (relatively!) they are actually very different. Globular clusters are massive, ancient clusters of stars that share a combined centre of gravity. The large masses of these clusters gives them a large gravitation field and allows them to survive for billions of year in some cases, as the strong gravitational interaction between the members rescues them from being torn apart by other galactic interactions. There are common to most decently sized galaxies, and they all orbit the galactic centre in a ‘halo’ outside of the typical galactic ‘plane‘ of stars. In contrast, open clusters are much smaller younger clusters within our galactic plane. Their smaller size makes them prone to being ripped apart as they pass by larger gravitational objects and other stars (similar to what will happen to Matariki over the next billion years or so) and so they usually only survive for several hundred million years.. Usually all the members of an open cluster will all have originated from the same molecular cloud and so will be of a similar age and composition, and are only found in galaxies where star formation is known to occur. Some of the more famous examples are the Jewel Box (in the Southern Cross) or Matariki (or Pleiades in Taurus). There are two really spectacular objects near these clusters: the Trifid and Lagoon nebulae, but they deserve their own post entirely so I’ll leave it there for today. If you want to know more have an explore around with this pearltree (right) or check back for the next post in a couple of days!